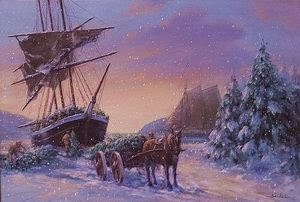 A few years ago I wrote a short story called The Christmas Tree Schooner for Guidepost Book's A Cup of Christmas Cheer and enjoyed learning all about Christmas tree ships on the Great Lakes. 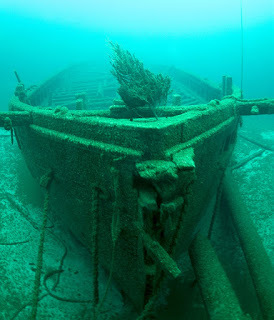 The great age of sail occurred on the Great Lakes following the Civil War with an unprecedented amount of schooners as its main type of vessel. Over 12,000 sailors worked aboard about 1,800 ships, mostly male, carrying up to 300,000 tons annually. Often their masters would have full or part ownership of the vessel and steam power eventually took over the seas, able to haul about a million tons using less vessels. Schooners that continued into the early 20th century, hauled grain, fish, lumber, and Christmas Trees. By the mid 19th century, decorating Christmas trees at Christmas time was a well established tradition brought to America by German immigrants. Many Germans settled around the Great Lakes, in cities like Chicago, and looked forward to the balsams and firs that would be brought to the cities from Michigan's Upper Peninsular. Fisherman and short-haul sailors would risk venturing across the choppy, ice-laden waters to the lumber camps and load up their schooners full of trees, purchased for a few cents each. 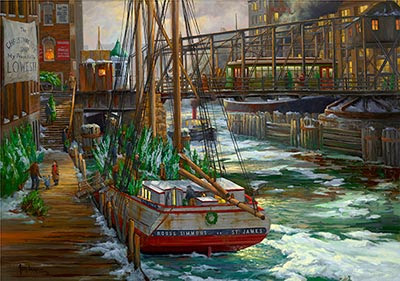 They would dock their ships along the Chicago River and other ports, setting up make-shift shops. 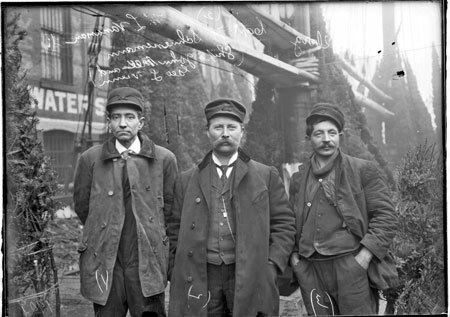 Eager citizens purchased the Christmas trees at seventy-fives cents a piece, garnering a tidy profit from one of the last hauls of the season. Hauling Christmas trees in late Novemeber and early December on the Great Lakes was risky business. Schooners such as Arendal, Actor, Experiment, Ida, and George L. Wrenn engaged in the hazardous Christmas tree trade during the period of 1876-1920. The schooners F. H. Williams and Coaster are among many who had to be towed into port looking like floating ice bergs, the captain of the F. H. Williams face frostbitten. 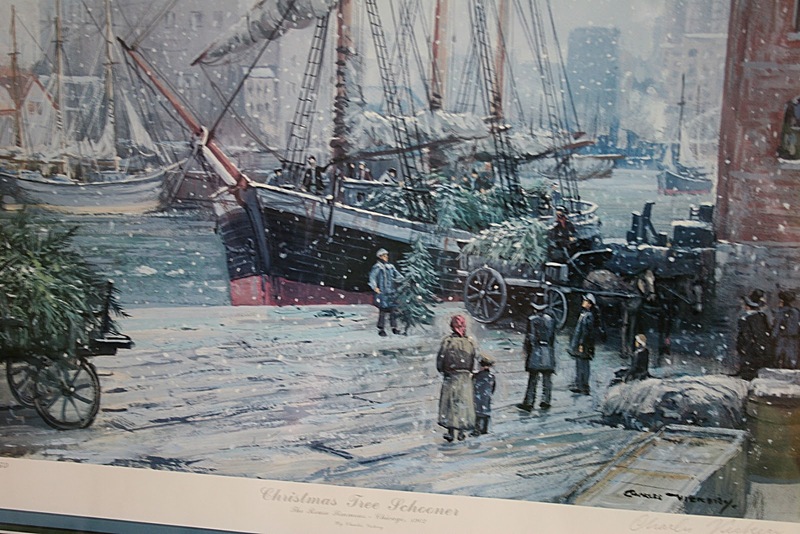 On the Lady Ellen's first haul her master could not sell her cargo to the Chicago market already laden with Christmas trees. The Caledonia and S. Thal are among those which sank. The Rouse Simmons is perhaps the most famous of the Christmas tree ships. It was one of the first Christmas ships, and one of the last. Christened in 1868, the schooner spent most of its life hauling lumber. But on November 23, 1912 while transporting its Yuletide cargo of evergreens it was caught in a ferocious storm on the Wisconsin shore. It, too, sank. Captain Herman Scheunemann perished with all of his crew, the same fate of his brother, captain of the S. Thal, several years earlier. The community was saddened by the loss of Capt. 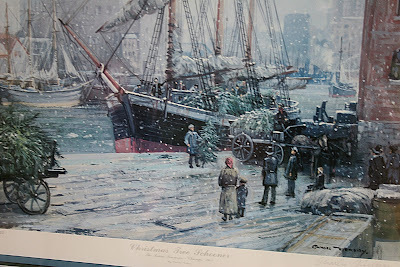 Scheunemann, who sold his Christmas trees from the deck of his schooner, tied to Chicago's Rush street bridge, for thirty years. They had Affectionately called "Christmas tree Scheunemann" he was admired for delivering good cheer to his neighbors. Some called him "Santa," as he was said to give some of his trees to the poor. His wife, and three daughters continued to sell trees and wreaths into the 1930's. In 1971, the sunken Rouse Simmons was discovered in Lake Michigan, its hull still filled with Christmas trees. Today, the tradition is continued by Makinaw, a Coast Guard Cutter. Volunteers unload its cargo of Christmas trees and deliver them to deserving families throughout the Chicago area. After all, what's Christmas without a Christmas tree? CHRISTMAS GIVEAWAY OF VOLUME 3 of A CUP OF CHRISTMAS CHEER, featuring my story "The Memory Shop." (Sorry, I'm all out of volume 2 with The Christmas Tree Schooner. Both complete sets can be ordered at Guideposts: see link below.) Please leave your email addy in a comment to be eligible. 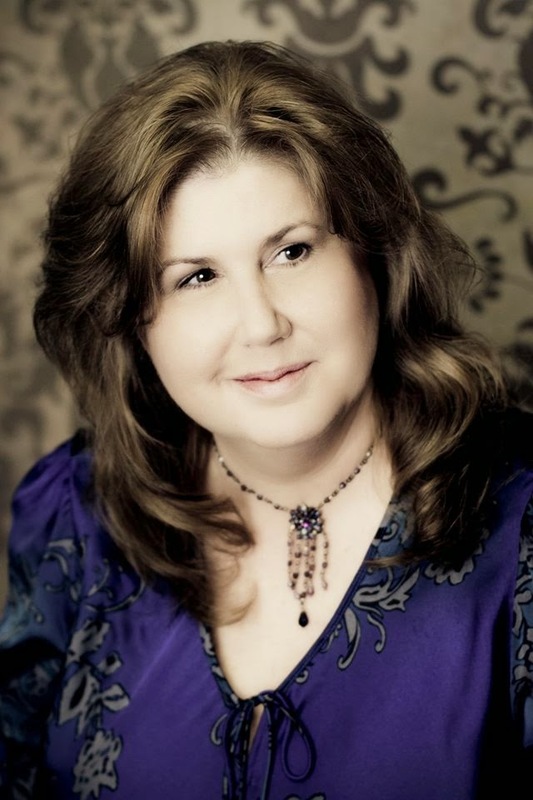 Carla Olson Gade's "Upon a Christmas Tree Schooner" is included in Vol. 1 & 2 of A Cup of Christmas Cheer from Guideposts Books and "The Memory Shop" is featured in Vol. 3 & 4. Her novella, "'Tis the Season," is from bestselling Mistletoe Memories. From Carla's heart to yours, Merry Christmas! Thank you for sharing this story because I have never heard of the Christmas tree ships. It certainly was a risk for those involved but oh, how much joy was given because of them! I never knew the story of how Christmas trees were first sold - we used to get ours at a lot in town when I was a child. Very interesting :). Thanks for the giveaway. Merry Christmas to you and yours. Now that was interesting! I had never heard of Christmas trees delivered by ship. Always interesting to visit HHH :) Merry Christmas! Thanks for your interesting post, Carla - I hadn't any previous knowledge of the Christmas tree ships, and enjoyed reading about them. Living alone, I don't bother with buying a live Christmas tree now, however, have fond memories of my father cutting a cedar tree from his farmland every year for our Christmas tree. 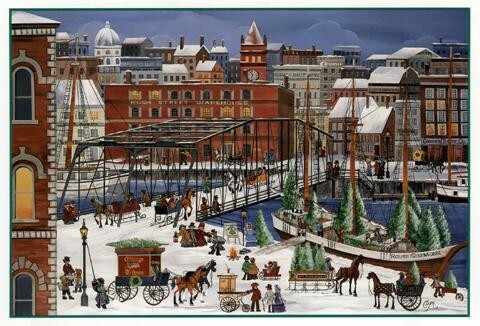 Thank you for sharing this Carla, I never knew about Christmas trees ships! I knew of the Christmas Tree Schooners. In fact, this year, a small theater company in my home town did a production about the story of the Rouse Simmons. 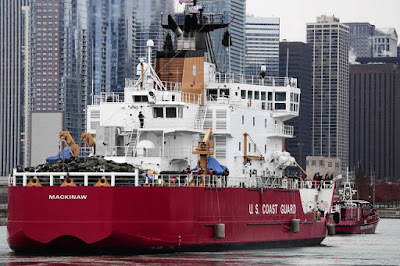 However, I did not know that the Coast Guard carries on the tradition.